Hotels throughout Salt Lake City have to accommodate numerous guests throughout each day. With heavy use of transporting both guests and luggage, these hotel elevators can easily become damaged and scratched. The daily wear-and-tear on these elevators can lead to a bad impression for all of your hotel guests. Addressing this type of metal surface damage can cost thousands in repairs and replacement. Recommissioning fees and downtime can be rather significant as well, leading to other inconveniences and additional costs. Elevator restoration is a specialty service that provides money-saving benefits and more. Surface film is a specialty window film that can be placed on other surfaces. The purpose of surface film is to defend surfaces from further damages while concealing existing damage. Metal Shield is a type of surface film that mimics the appearance of metal surfaces, providing a range of different finishes for perfect color matching. By installing Metal Shield in your elevator, you can quickly hide all the existing damage in order to provide the best impression of your hotel. In addition to restoring aesthetics, Metal Shield offers a thick layer of protection to defend against further wear-and-tear and possible vandalism efforts. This sacrificial film is meant to be damaged, removed, and replaced for constant protection and incredible appearance. Metal Shield Installation for Salt Lake City Properties from Kansas City Green Window Film on Vimeo. GreenLight Window Films is proud to be the number one elevator restoration contractor serving the Salt Lake City area. Metal restoration takes art and precision for a seamless application that’s invisible to the naked eye. Our elevator restoration specialists deliver the best solutions for defending your elevator and skipping recommissioning costs. 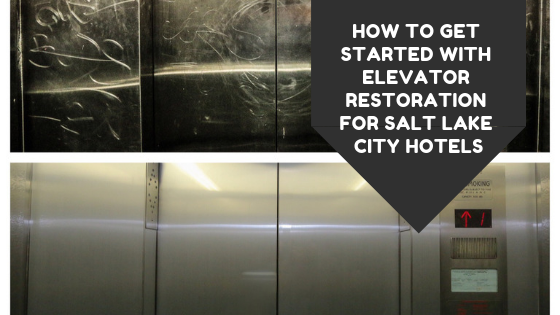 For more information regarding elevator restoration for your Salt Lake City hotel, please contact us!